This fabulous flat is in the main village of Woolacombe but slightly away from the main drag so nice and quiet when you are inside! We provide all linen, big white fluffy towels and beach towels are included, along with a welcome pack of food and wine. In the Winter months we provide big fluffy hotel style dressing gowns which are perfect to snuggle up in after an afternoon in the surf! In easy reach of beaches, coastal walks, local bars & restaurants, this fresh, light and modern flat makes a superb holiday property providing comfort, luxury and practicality whilst enjoying one of the best locations in the surrounding area. Hi, we are Mike and Helen who moved to Woolacombe from London in 2006 to start a family. We now live in the village with our 2 children and wouldn't give up the beach life for anything! We lived at the House at Pebbles initially but after our 2nd child was born we moved to a bigger house, which we also now let in the summer while we are on holiday. We love our summer holidays and therefore are happy to share our houses with like-minded people who we know will look after it and enjoy the area and the safety for children as much as we do. We bought originally to use as an office but decided to redecorate, revamp and holiday let it as so many friends who stayed there said how lovely it was to be so close to everything but still be tucked away in a quiet space. This is a brilliant place for couples who just want to chill out. It's central to all the bars and restaurants and easy access to the beach, but is still quiet. One shower room with shower cubicle (and a very good shower), sink and toilet. There is also a large heated towel rail an big fluffy white towels. 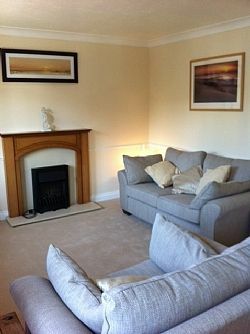 The living room has a large sofa and flat screen tv with DVD player, equipped with lots of DVD's, books and games. There is an ipod / phone doc. There is a fireplace with an electric fire and a dining table and chairs. The kitchen is well equipped with a gas cooker, overhead extractor, fridge, microwave, toaster and everything we think you might need in terms of equipment. Notes on accommodation: The flat is a lovely cosy little place to stay. It is comfortable for 2 people and could fit more on a sofa bed but we believe that is it just right for 2 and don’t want you to be squashed. We have made it luxurious, not cheap and cheerful. The property is a non smoking, no pet property. Outside: The flat has no outside space apart from the stairs outside which does have a rack for hanging wetsuits to dry. The car park is at the back of the flat and is off the road and marked as Private. There is space for one car to park. Utility Room: There isn’t room for a washing machine however the laundrette is in the same street so washing and drying can be easily achieved. There is an airer and also an iron and ironing board. Cleaning / Towels / Linen / Maid service: All linen and towels are provided, along with tea towels and beach towels etc. The property is cleaned weekly on changeover however for stays of more than a week a linen change can be arranged at your convenience. Other: The flat has full broadband internet access, central heating throughout that is easily controllable by guests but rarely needed. Fabulous flat. Well equipped. Wine chocolates and cream tea there when we arrived. We had a fantastic break here. Stayed for 3 nights and didn’t need to use our car once. Everything is a 5 minute walk away. Lovely flat. Very cosy and everything you need. Very kind of the owners to leave wine chocolates and a cream tea on arrival. What a lovely touch. Will definitely stay here again. Couldn’t fault the flat or the location. Fabulous. Lovely apartment, clean, very comfortable and good position. A great apartment two minutes from the beach. Very comfortable and well appointed; compact but plenty of space. Very clean. Nice treats left by the owner much appreciated. Perfectly situated in the heart of Woolacombe. Clean and cosy great place to relax after a long days walking. The scones and wine Helen left were a lovely treat!! A great location, a great property with well appointed facilities for guests, a dedicated parking space in high season a bonus! Happy to recommend for anyone thinking of a visit to this part of North Devon. We had a great time and it was just what we needed to blow away the cobwebs after christmas. A great location and the apartment was cosy. Painting courses are available from the Gallery in Woolacombe. Walking holidays are popular around the cliffs and this is an ideal base to start from. Woolacombe boasts 3 beaches – the spectacular Woolacombe sands which runs over 3 miles from Woolacombe to Putsborough, Barricane Beach made entirely from shells washed in on the Gulf Stream, and Combesgate Beach – The place for rock pool lovers. All beaches are less than 10 minutes walk from the property. Restaurants - 14 within walking distance of the property. Woolacombe has a bank, post office, a chemist and small supermarket. Large supermarkets are available 15 mins drive away. Booking Notes: A 25% deposit must be made to confirm the booking, with the balance being payable 8 weeks before the commencement of the rental. A £50 refundable damage deposit is also required. Changeover Day: Friday to Friday however this is flexible dependant on adjacent bookings Notes on prices: All prices are per week in GBP and include all heating and hot water.